New with remainder mark. Multiple copies are available. Fifty all-new essays that got their authors into Harvard, with updated statistics and analysis, showing what worked, what didn’t, and how you can do it, too. With talented applicants coming from the top high schools as well as the pressure to succeed from family and friends, it’s no wonder that writing college application essays is one of the most stressful tasks high schoolers face. Add in how hard it is to get started or brag about accomplishments or order stories for maximum effect, and it’s a wonder that any ever get written. Each essay in this collection is from a Harvard student who made the cut and is followed by analysis by the staff of The Harvard Crimson where strengths and weakness are detailed to show readers how they can approach their own stories and ultimately write their own high-caliber essay. 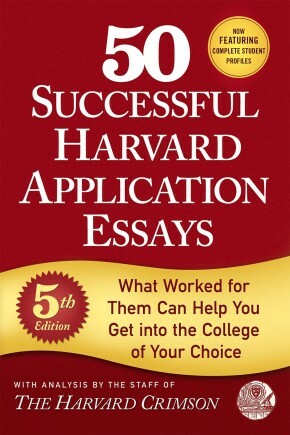 50 Successful Harvard Application Essays ’ all-new essays and straightforward advice make it the first stop for applicants who are looking to craft essays that get them accepted to the school of their dreams.